I have been working on my creative side this past couple of weeks and have hit my woolly straps by using up some leftover wool to begin making a scarf for Master Oh Waily, and even went out on a limb by purchasing needles and wool to make socks for both my little monsters beloved children. Please find below, for your amusement and amazement, pictures of the woolly works in progress. The photos are not the best as the only large flat place to lay things out at the moment is in a dark part of the house and I just had to make do today. 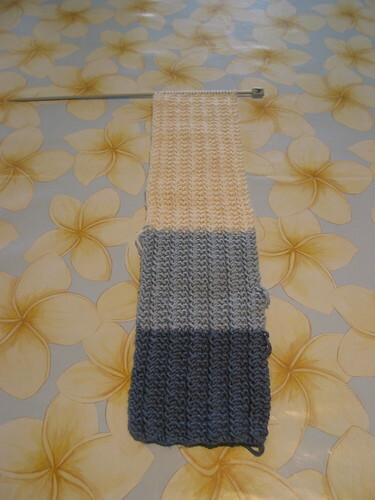 The Scarf - about half way done. For those who may be interested, the pattern is by Stephanie Pearl-McPhee and is called One Row Handspun Scarf. Nice and simple, but not boring to look at. 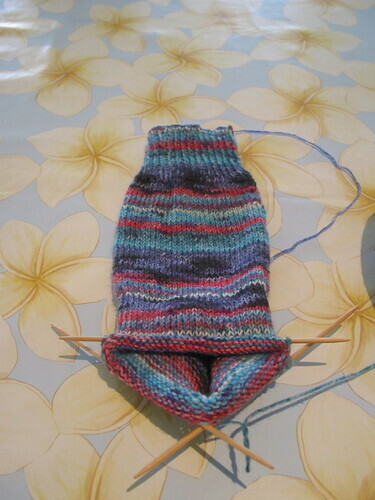 The sock is knitted in self-patterning Opal wool. While I love the colour, the wool is incredibly twisty – as you can see in the photograph. 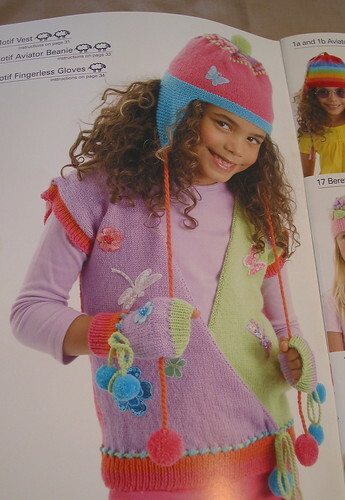 The pattern is from Ashfords, but frankly I think it may fit me better than my nearly four year old. Not quite what I was expecting it to do. But that’s fine. If it is way too large, then she can grow into them and I will start again for a pair that will fit her now. The Next Idea - the mitts and the top. Oh, and while I have your knitty attention, perhaps I could introduce you to Ravelry? Or should I say, enable you? A very useful, but addictive community of knitters and crochet enthusiasts. The last image is of Miss Oh Waily’s work. 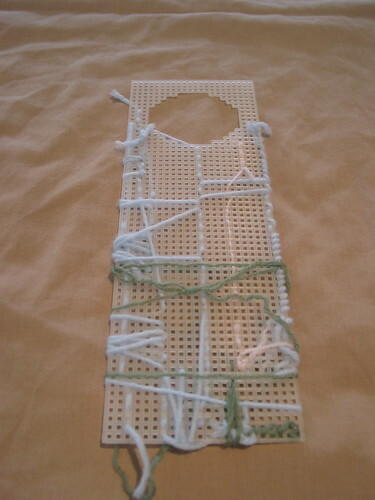 Some scrap wool, a plastic canvas designed for making door hanging signs and a large needle. Bob’s your uncle. A home made, mostly, sewing practice. Great for little fingers, concentration and new skill development. An all around winner, really. And finally there is a glimmer of hope on the exercise front. I have revamped the look of Active Mum and have actually posted a small update today. What with all this creativity and exercise I think I may need to go lie down. Happy knitting everyone. Go you! Great work and I am so impressed that your working on DPNs, I can’t use them to save myself. I love the colours in your scarf.